The Rapid Deployment Crane Serviced Structure is designed for on-site manufacturing and equipment maintenance. NOW THERE'S A SOLUTION THAT INTEGRATES CRANE SERVICE IN A RAPID DEPLOYMENT PREFABRICATED STRUCTURE. Designed for on-site manufacturing and equipment maintenance, the Rapid Deployment Crane Serviced Structure takes advantage of the patented Olympic Folding Building method of panelized construction to provide a robust building envelope over an integrated crane superstructure. Our unique steel superstructure carries crane loads as well as providing attachment points for Olympic Folding Building sections and panels. After erecting the superstructure, folding roof sections are used to complete roof and upper side walls. Side and end wall panels are then attached to superstructure and ground to complete building envelope. 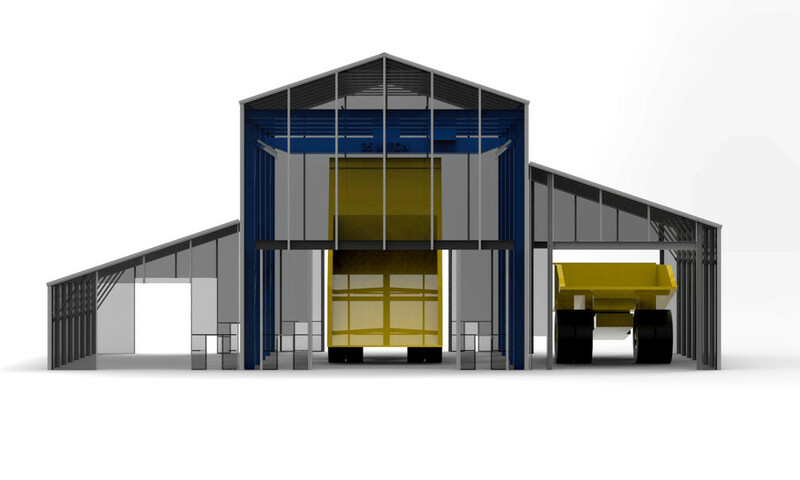 Optional lean-to systems expand your facility for additional maintenance and wash bay functions. 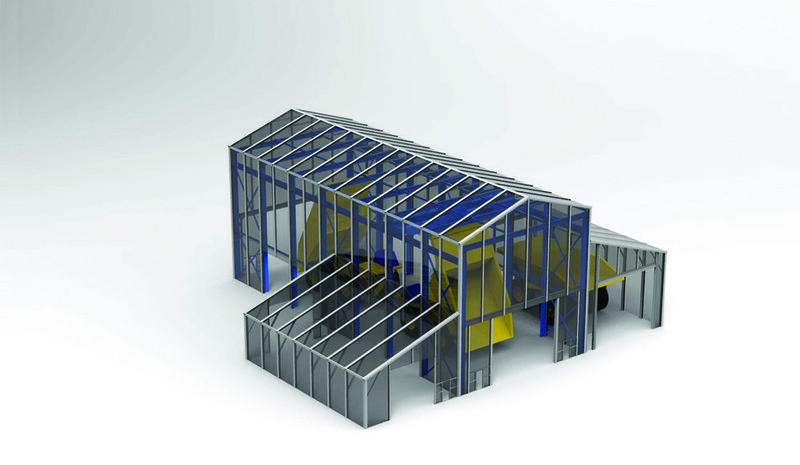 With its modular design, you can easily add to your facility as your project and maintenance needs grow. With layouts designed around specific equipment, you can be confident that you have adequate access for all your preventative maintenance operations. Experience the benefits of shorter mobilization duration with the knowledge that you have invested in a piece of equipment, which easily moves with your fleet to the next project. 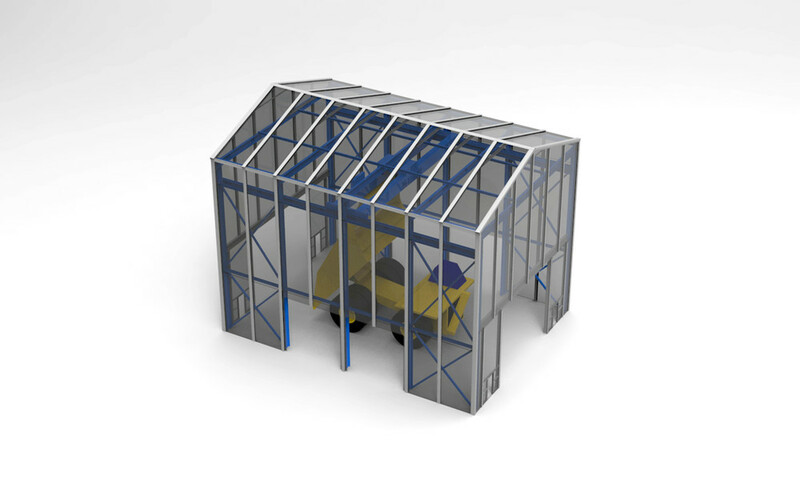 Designed for 50 PSF (2.39 KPA) roof snow loads and 120 MPH (193 KPH) wind loads, your investment is deployable across most North American locations. Bring value to your site operation by eliminating weather impacts to preventive maintenance or on site fabrication operations. Standard crane capacities to 35 Ton, 53' crane bay clear span, and 53' hook height. 80' standard single bay length, 140' standard double bay.